Over the past months we have demonstrated contact lens enabled eyewear for mobile devices including smartphones, portable game devices and media players that deliver panoramic, high-resolution experiences for entertainment and planned Augmented Reality (AR)* applications”, said Steve Willey, Innovega CEO. “During this same period, we collaborated with partners to finalize initial specifications of launch platforms which include a screen size that is equivalent to a 240 inch television (viewed at a usual distance of 10 feet)”. Willey added, “Unless the display industry can deliver transparent, high-performance and compact eyewear, developers of AR and other compelling media applications will simply fail to create the excitement that consumers crave and the functionality that professional users absolutely need”. Innovega’s new and natural interface comprises familiar, light-weight eyewear working with advanced contact lenses. One hundred million global consumers, including more than 20% of America’s 18 to 34 year-old, already wear contact lenses. With low switching costs, Innovega expects many will join other early adopter groups who wish to access rich media while remaining fully involved in their real-world activities. Management believes that consumers will be thrilled to wear and benefit from its new lens-based eyewear given the unique combination of benefits that this new interface offers. Innovega designers and partners considered the future of personal media, social networking, and mobile computing, and converged upon an aggressive design-point that meets today’s needs as well as demands of high-performance AR which require a see-through and panoramic display interface. Innovega refers to its innovative product as a ‘lifestyle interface‘, since consumers view their digital content in a way that is similar to how they see the world around them. By providing a transparent, fashionable, and comfortable interface that is consistent with today’s active lifestyles, the architecture also eliminates the social barrier that traditional opaque and bulky video eyewear seems to create. The Innovega iOptikTM architecture meets the demanding performance requirements of AR by eliminating the focusing optics that tend to limit the field of view of displayed media. 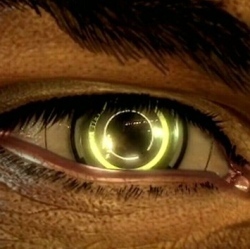 Innovega replaces them with micro- and nano-fabricated optical elements that are integrated into otherwise conventional contact lenses. The recent demonstration of stylish, megapixel eyewear has proven the power of this proprietary architecture. Innovega will provide the new system to media and consumer electronics OEMs who wish to design natural display interfaces that consumers want and need. Innovega believes that its new personal display interface will become an essential social media and entertainment accessory.